If you are dealing with the currency of the European Union, there is always the risk of getting counterfeit notes. To avoid losses, and other related troubles, it is important to know how to distinguish genuine Euro banknotes from fakes. With the help of the Internet or of samples at the information counters in the banks, examine the appearance, inherent in genuine Euro banknotes. If the picture on your money different, so it's a fake. View the bill up to the light. In such a position on genuine banknotes will appear the watermark and a transparent register. These elements must be equally visible from both sides of the bill. Watermark on a real money well-drawn and has the effect of halftones. Evaluate the appearance of the security thread, which is arranged vertically and divides the bill in half. On a genuine bill, it is clearly visible in any position, and contains inscriptions and images. Check for the hologram. The image should change under different angles of inclination. If the same image is viewed from different points of view – before you fake. 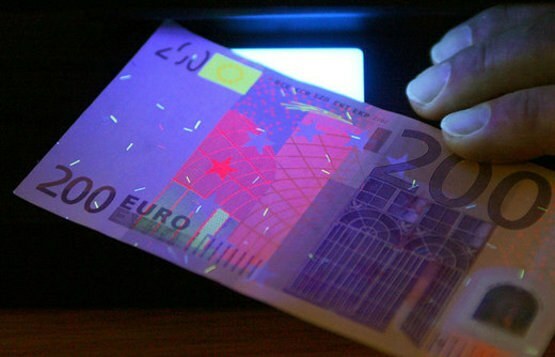 Denominations of 10, 20 and 50 Euro with a vertical holographic strip which follow each other, the Euro symbol and the numeral indicating the nominal value. On the larger money security strip is missing, but has a holographic icon, which shows the image of the architectural motif, are replaced by a denomination. Note the numbers in the corner of the banknote, depicting face value: they are made with special paint. As a result, the color under different angles of view changes from bright purple to dark purple. Rely on tactile sensation. As a result a special way of drawing the basic images they all felt relief. The paper used for the manufacture of Euro, it is highly unusual to the touch: it is made of 100% cotton. If there is an automatic detector, check it to a bill on the presence of ultraviolet, magnetic and infrared marks. In Russia most frequently counterfeited banknotes of 50, 100 and 200 euros, and at home of the currency – denomination of 10, 20, 50 euros. At first, it is useful to keep on hand genuine Euro of different value to compare with them the money that you give.